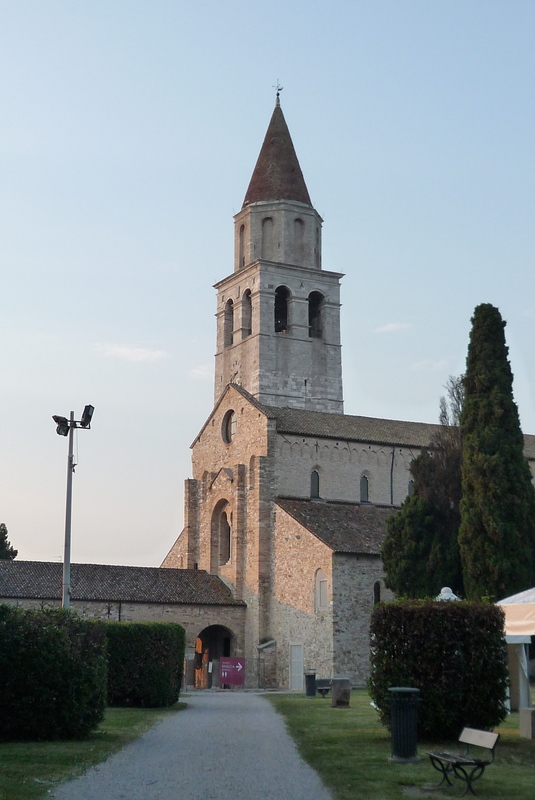 Another surprise of sorts (I didn’t know of its existence till a day before we got there), impossible-to-spell Aquileia is a UNESCO World Heritage Site, and one of the largest archeological digs in Italy. 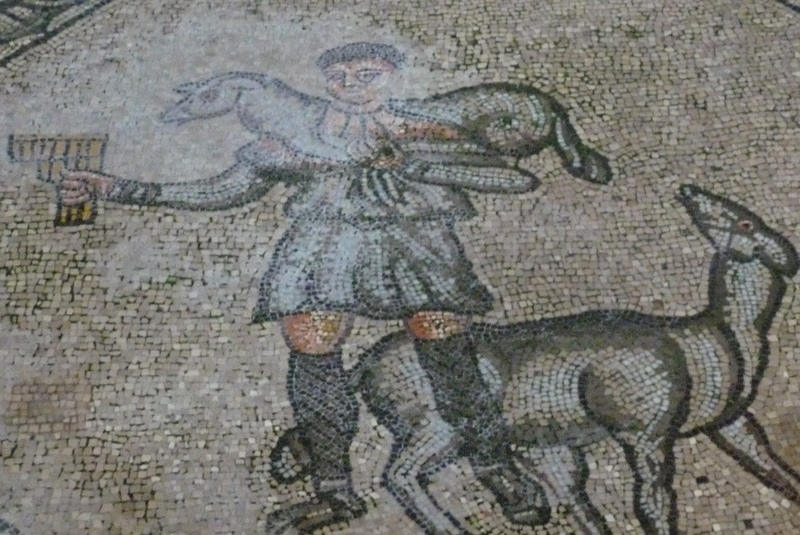 The town is packed with Roman ruins, but mostly of the sort where a great imagination is required…i.e. foundations of buildings and the like. Lacking an imagination after a long day in the saddle, we instead focussed on the Basilica, also part of the World Heritage package. Here is the outside – a big, Romanesque church. But the treasure of this church is inside. Most of it is from relatively recent times…in Europe that is the 11th century and up I’d say. The wooden ceiling, for example, is from the 15th century. 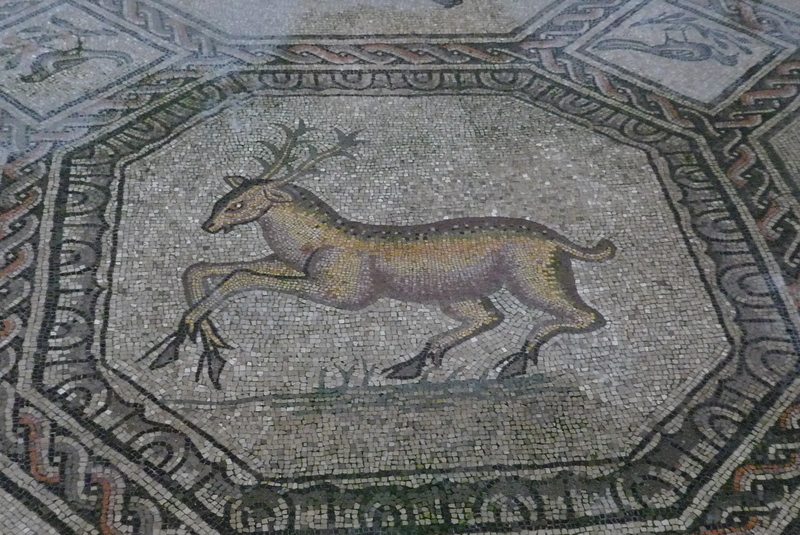 But an amazing 4th century mosaic covers virtually the whole floor, and it is very well preserved, thanks to the folks in the Middle Ages covering it up with their own floor for a thousand years or so. 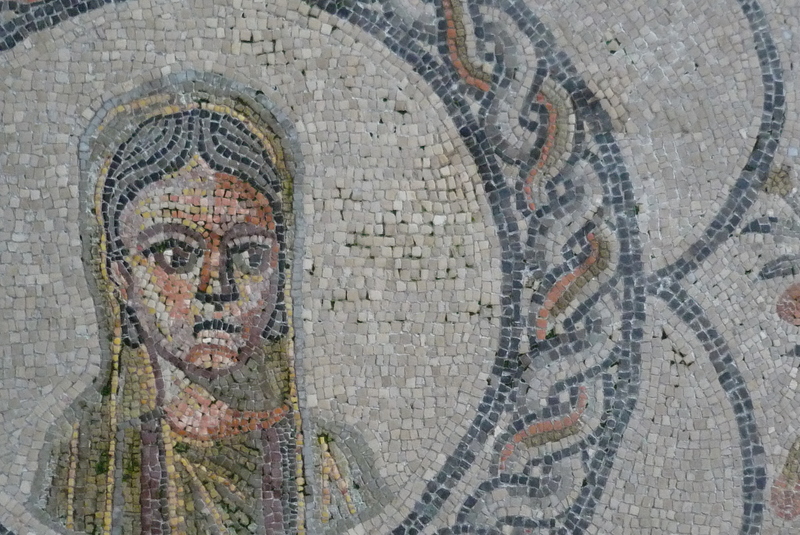 The exciting thing about all this to me is that, although the artwork is obviously Roman, all the imagery is Christian. 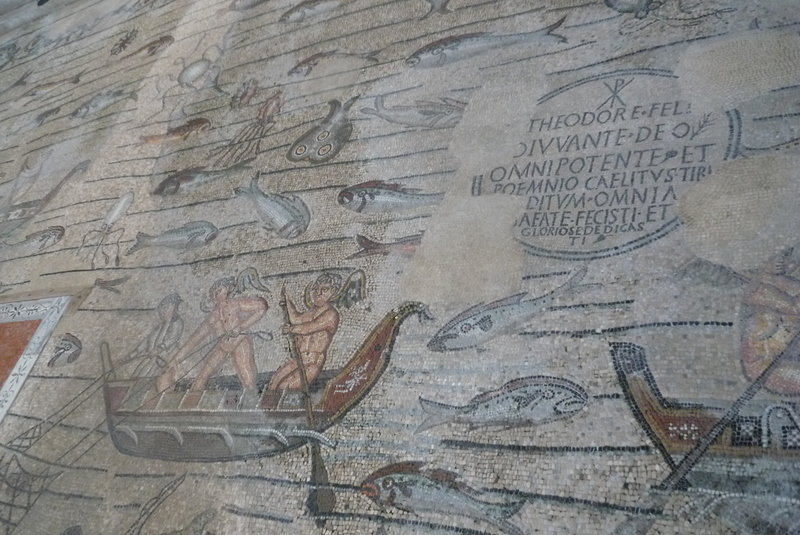 In France you just can’t find Christian artwork older than the 10th or 11th century. Here you have something that was produced shortly after Christianity became the official religion of the Roman Empire. Really something to behold. Even more impressive was the Jesus frame. If you need proof that man created God in his image, look no further! Yup, that’s Jesus protecting his flock, decked out in Roman clothing and clean shaven. Reminded me of that Good Times episode when Michael changed the family’s portrait of Jesus for a black one! Why don’t they make shows like that anymore…? 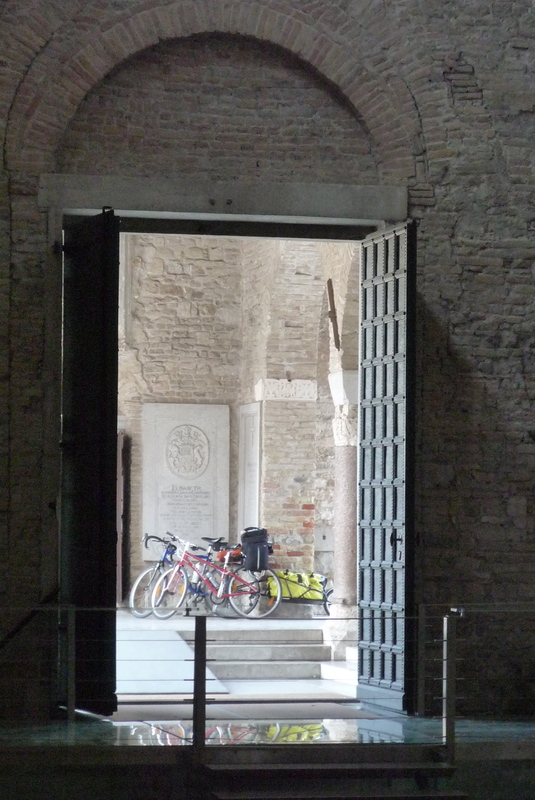 And, since this is a cycling blog, here are our bikes waiting for us outside the main entrance. Next up, Slovenia! Well, if that shepherd is Jesus, he’s got a panpipe in one hand, and I’d say that’s fairly scandalous! 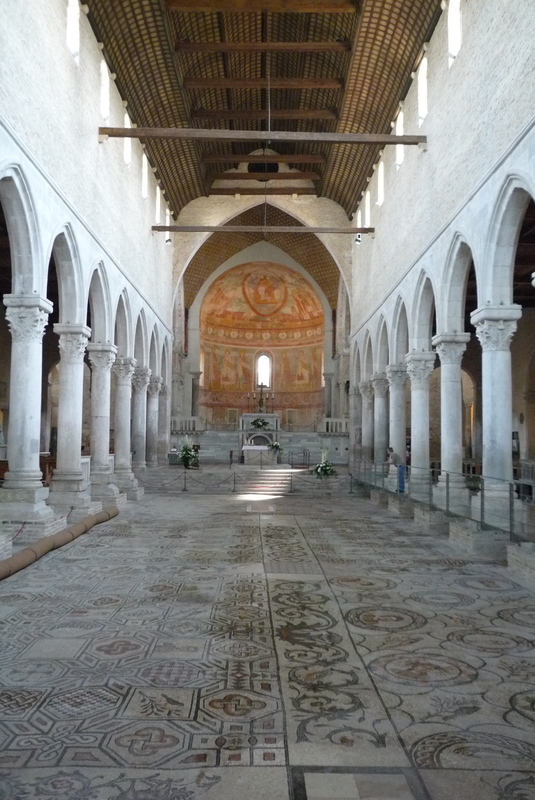 It’s actually quite possible to spell it, if you do so correctly: Aquileia — no “c”!